Aditya Birla Health Insurance is one of the biggest health insurance companies in India. The company is providing a wide range of helpful and affordable insurance policies. With this wide range, it will be easier for you to get the best plan according to your needs. This company is basically a joint venture between South Africa-based MMI Holdings Ltd, which owns 49% stake in the venture. The company looking forward to position itself in the highly competitive health insurance business. The aim is to become the top insurance company in the health insurance Industry. Aditya Birla Health Insurance is working great in the Indian market. Right now, the company is dealing with several products for individuals, families, and groups. Some of the key features and benefits of ABHI can be listed as follows. Flexible plan options: When it comes to Aditya Birla, you can get multiple policies which can easily go well with your needs. There are a few plans available for specific benefits that include personal accident, critical illness, cancer, etc. In addition to this, there are some plans as well which offers benefits for groups. Wellness coaching: One of the biggest benefits of Aditya Birla Health Insurance is the access to health industry experts anytime and anywhere. By contacting an online specialist, it will be easier for customers to get their doubts clarified. Network hospitals: Among all other benefits, one of such benefits that attract its customers a lot is the network of hospitals and doctors. Customers can access the list of hospitals and doctors in their cities/towns by visiting the company website. Health Returns: The company offers rewards for healthy behavior in its customers. Customers can access this information by visiting the company’s official website. Tax relief: The premium amount paid towards several health insurance policies under Aditya Birla is eligible for income tax benefit as per section 80D of the Income Tax Act. 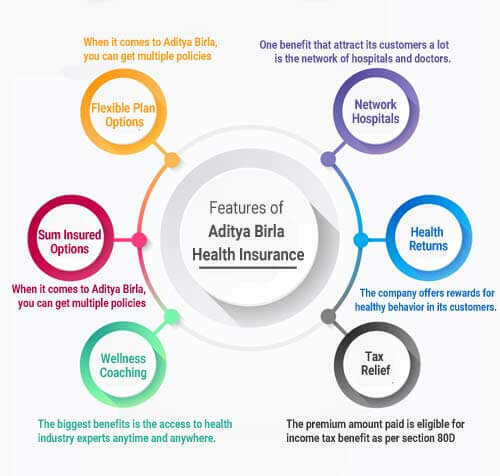 Aditya Birla Health Insurance comes along with several helpful benefits that will surely attract you towards its effective health insurance plans. 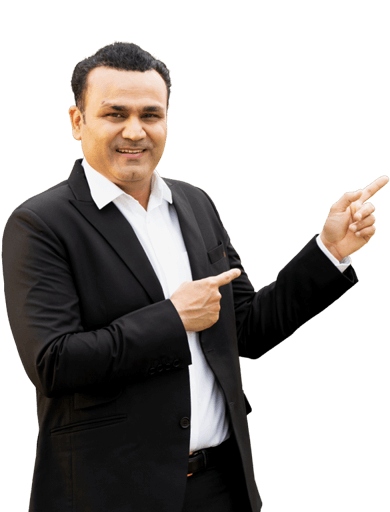 Longer tenure : Aditya Birla Health Insurance Company is good ar offering longer plan terms that start from 1 year to 3 years, which saves you from the hassles of renewing your health plan every year. High sum assured: Everyone will agree to this that the medical expenses are rising day by day. Health insurance plans by this company come along with the high sum assured amount that starts from Rs.10 lakh, up to Rs.2 crore for comprehensive plans. Cover for pre/post hospitalization expenses: Aditya Birla health insurance plans also offer pre-hospitalisation charges and post-hospitalization for the term that vary according to the plan which has been chosen. Cover for additional expenses: Under the health insurance plans by Aditya Birla you will get a wide range of cover and that will assist you in getting the assistance to deal with the additional expenses such as ICU charges, room rent, ICU charges, operation room charges, specialist’s fee, medicines, etc. No clause for minimum hospitalization: There are several plans that provide coverage against various daycare surgeries and procedures that don't ask for hospitalization for over 24 hours. Domiciliary hospitalization : There are many plans by Aditya Birla Health Insurance for domiciliary hospitalization where the policyholder has taken treatment at home and not a hospital or nursing clinic because of medical constraints. Choice of hospital room category: This is the amazing feature by Aditya Birla Health Insurance Company. Under the same, the policyholder will have the option to choose the hospital room for their hospitalization. If the insured has chosen a lower room category, they will be eligible to file for the reimbursement of the same at the time of raising a claim. Tax benefits:Along with the essential health coverage, Aditya Birla health insurance plans come with tax benefits also5 under provisions of Section 80D of the Income Tax Act, 1961. Cumulative bonus : Depending on the plan that you have chosen, you will be eligible for a Cumulative Bonus of 10% to 20% which is provided for each claim-free policy year. Free health check-up Every insured policy. Active Assure Diamond Plan is an effective Health Insurance plan that offers comprehensive coverage and sum assured of up to 2 crores. 150% reload of the fixed sum assured. Provides coverage against 586-day care procedures. Emergency assistance for international and domestic as well. IN-patient hospitalization Coverage against room rent, doctor’s fee, operation theatre expenses, medicines, etc. Pre and post hospitaliation 30 days before your hospitaliation and 60 days after your hospitalization. Along with the basic health insurance plan, this is the plan that offers unique benefits such as health returns, reload of sum insured, room choice, chronic management program and many other things. Earn upto 30 percent of your premium policy as health returns. One day cover for cost of medicines, dianostics test, doctor consultation and many more. You are free to choose the hospital room as per your liking. One more effective health insurance plan by Aditya Birla Group. Earn upto 30 percent of the sum assured as a health return benefit on staying healthy. Day 1 cover for chronic diseases such as diabetes, asthama, cholestrol,etc. Cumulative bonus 10% percent of the sum insured for every claim free year. It is a comprehensive insurance plan that offers additional coverage at affordable price. This plan allows you to overcome from financial shortcomings for the treatments. Wellness coach Get a wellness coach to guide you about nutrition, fitness, and lifestyle habits. This plan protect you from rising financial burden during hospitlization. Flexibility in choice of coverage. It is a helpful health insurance plan that covers all stages of cancer from minor to advanced. Stages cover with payout on early stage(50% of sum insured), major stage (100% of sum insured) and advanced (150 % of sum insured). Cumulative bonus of 10% upto a maximum 100% of sum insured. Protection Against all 3 stages, early, major and advanced. Compare plans on the basis of features, oremium and benefits. The following documents must be submitted to the insurer while making a claim under a particular policy. 1. Why choose Aditya Birla Health Insurance? Along with the basic health plans, this company will offer additional benefits in the form of health returns and wellness coach. 2. There is any plan that offers maternity cover? Yes, under a few plans by Aditya Birla Health Insurance Company, you will get coverage for new baby expenses, vaccination, necessary treatments and much more. For this, you have to opt for maternity benefit cover. 3. Why should someone invest in a health insurance plan? Because of the rising medical cost, it becomes necessary to own an effective form of health insurance plan to beat all medical emergencies. 4. What is the claim procedure? Under Personal accident plan, first, you have to inform the insurance company within 7 days. After that, you have to submit the necessary documents along with the claim form within 30 days. 5. What is the survival period under a cancer insurance plan? A survival period is just 7 days following the date of diagnosis. 6. What is the benefit of choosing a long-term policy? On choosing the long-term policy you will discount of 7.5 to 10 percent on your premium.